The Thermo Forma 310 Direct Heat CO2 Incubator gives you excellent control over your samples within a compact space saving footprint. This high capacity incubator uses a thermal conductivity CO2 gas sensor to monitor your CO2 concentrations. The Forma 310 is controlled by microprocessor and gives users the ability to set and calibrate temperature, relative humidity, overtemperature and CO2 levels through intuitive controls. Users can also configure their audio and visual alarm settings, that include low temperature, and CO2 level alarms, and for added security, an access code can be created, and contacts are available to configure a remote alarm system. 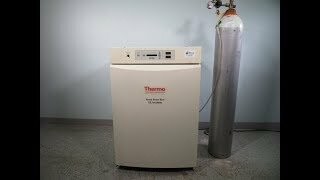 The Thermo Forma 310 Direct Heat CO2 Incubator is easy to maintain and clean and has a variety of contamination containment measures. This CO2 incubator comes with a HEPA Filter Airflow system, continuously filtering air within the chamber to refresh every 60 seconds. With use of the HEPA2 VOC filter, volatile organic vapors are removed and copper components prevent bacterial and fungal growth. Within the chamber, a polished stainless interior with coved corners facilitates easy clean up, and sturdy stainless steel shelving can be quickly adjusted or removed to be cleaned without the use of tools. Lastly the inner door gasket ensures a tight seal and prevents heat and CO2 loss while in operation. This incubator door gasket can be removed for cleansing as well. This Thermo Forma 310 Direct Heat CO2 Incubator has been calibrated to the factory specifications. All of our lab equipment comes back with our standard warranty. Should you have any questions, please don't hesitate to contact us.